The Skirmish at Blackwater Creek (actually a river) or Skirmish at Milford was an American Civil War skirmish that took place in central Missouri on December 19, 1861 near present day Valley City. It was a major victory for the North. Following the Siege of Lexington, Missouri the secessionist Missouri State Guard withdrew to the southwest portion of Missouri. 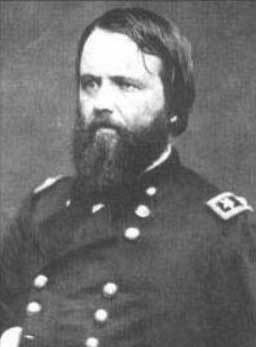 Some Southern recruiters such as Colonel Franklin S. Robertson remained, attempting to fill their regiments. Robertson, a store owner in Saline County, Missouri born in Kentucky had been granted his commission by Major General Sterling Price at Lexington. Meanwhile, Union Brigadier General John Pope, in command of the District of Central Missouri, was determined to suppress Southern recruiting in the region. He headed Southwest from Sedalia before turning the main body north toward Warrensburg. Robertson collected his recruits at Grand Pass where they elected officers. On December 16, 1861 the 750 men began their March south. The plan was to first link up with Colonel J.J. Clarkson’s recruits near Warrensburg, Missouri before proceeding south to General Price. They were unable to merge with Clarkson but they were joined by Colonel Ebenezer Magoffin, who was on parole after being captured while attempting to recruit his own regiment. Magoffin is notable as the brother of Kentucky Governor Beriah Magoffin. General Pope learned on the evening of December 18 that Robertson’s force would be camped at Milford. Early the next morning Pope’s force marched toward Knob Noster, Missouri. Pope ordered Colonel Jefferson C. Davis’s brigade to the Blackwater bridge where he was to force the bridge. Simultaneously a battalion of the 2nd Missouri Cavalry (“Merrill’s Horse”) moved northeast to complete the envelopment. Realizing his guardsmen were in a precarious position, Robertson formed a firing line of approximately 250 men while Colonel Magoffin was detailed with several dozen men to take possession of the bridge before the Federals arrived. It was insufficient. Colonel Davis ordered three companies of the 4th United States Cavalry forward under Lieutenant Charles Copley Amory, with the 1st Iowa Cavalry in support. Amory dismounted his men and gave two volleys to the bridge’s defenders causing them to waver. Amory ordered a charge and the defenders fled. The now mounted force pursued, encountering some casualties at they made contact with the second line. They held their positions as the infantry came up and the envelopment was completed. Robertson's men recognized their predicament and requested a brief truce before surrendering.